The Sun climbs northwards at its fastest for the year in March and crosses the sky’s equator at 21:58 on the 20th, the time of our vernal or spring equinox. 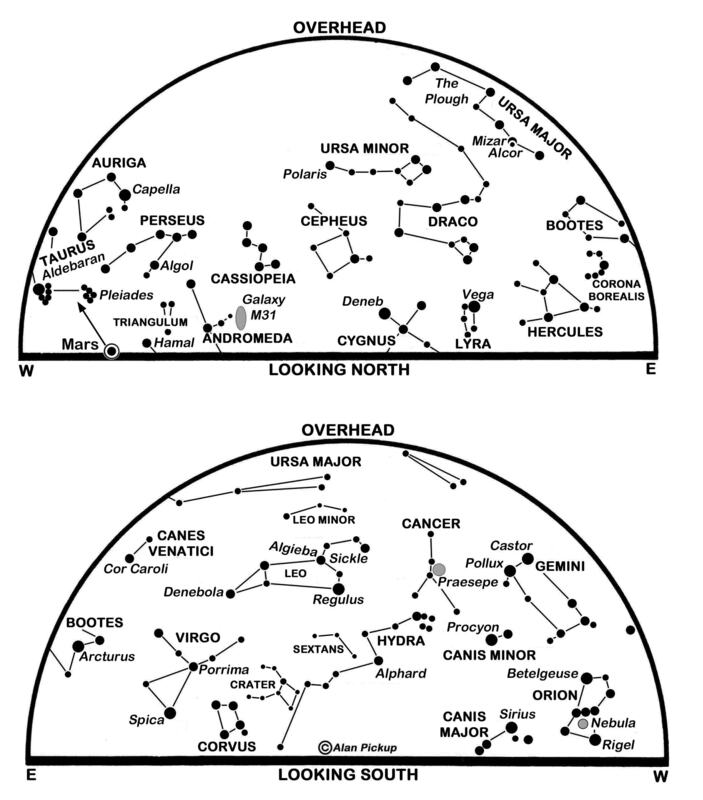 As the days lengthen rapidly, the stars in the evening sky appear to drift sharply westwards so that Orion, which is astride the meridian as the night begins on the 1st, stands 45° over in the south-west by nightfall on the 31st. Another consequence of the Sun’s motion is that the Earth’s shadow, on the night side of the planet, is tilting increasingly southwards so that it no longer reaches so far above Scotland at midnight. Indeed, by the end of March the shadow is shallow enough that satellites passing a few hundred kilometres above our heads may be illuminated by the Sun at any time of night. This allows them to appear as moving points of light against the stars as they take a few minutes to cross the sky. 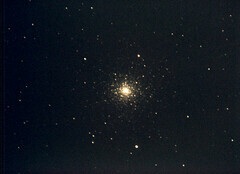 Some are steady in brightness while others pulsate or flash as they tumble or spin in orbit. Dozens of satellites are naked-eye-visible every night, while many times this number may be glimpsed through binoculars. 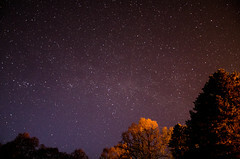 Predictions of when and where to look, including plots of their tracks against the stars, may be obtained online for free, or example from heavens-above.com, or via smartphone apps. Of particular interest are the so-called Iridium satellites which can outshine every other object in the sky, bar the Sun and Moon, during brief flares when their orientation to the Sun and the observer is just right. Although online predictions also include these, Iridium flares are falling rapidly in frequency since the satellites responsible are being deorbited as they are replaced by 2nd generation (and non-flaring) craft. The most obvious steadily-shining satellite is, of course, the International Space Station which can outshine Sirius as it transits up to 40° high from west to east across Edinburgh’s southern sky. As it orbits the Earth every 93 minutes at a height near 405 km, it is visible before dawn until about the 15th and begins a series of evening passes a week later. Sunrise/sunset times for Edinburgh change from 07:05/17:46 GMT on the 1st to 05:47/18:48 GMT (06:47/19:48 BST) on the 31st which is the day that we set our clocks to British Summer Time. The Moon is new on the 6th and spectacular over the following days as its brightly earthlit crescent stands higher each evening in the west-south-west. Catch the Moon 12° below Mars on the 10th and 6° below and left of the planet on the 11th. Mars itself stands around 30° high in the west-south-west at nightfall and is well to the north of west when it sets before midnight. This month it dims from magnitude 1.2 to 1.4 as it speeds more than 20° north-eastwards from Aries into Taurus to end the period only 3° below-left of the Pleiades. Mercury has been enjoying its best spell of evening visibility this year, but is now fading rapidly and may be lost from view by the 7th. Binoculars show it shining at magnitude 0.1 on the 1st as it stands 10° directly above the sunset position forty minutes after sunset. The Moon and planets never stray far from the ecliptic, the line around the sky that traces the apparent path of the Sun during our Earth’s orbit. The ecliptic slants steeply across our south-west at nightfall towards the Sun’s most northerly point which it reaches to the north of Orion at our summer solstice in June. Given a clear dark evening, this is the best time of year to spy a broad cone of light stretching along the ecliptic from the last of the fading twilight. Dubbed the zodiacal light, this glow comes from sunlight scattering from interplanetary dust particles and was the subject on which Brian May, the lead guitarist of Queen, gained his doctorate. As the Moon continues around the sky, it reaches first quarter on the 14th and passes just north of the star Regulus in Leo on the night of the 18/19th. Regulus, 45° high on Edinburgh’s meridian at our map times, lies less than a Moon’s breadth above the ecliptic and marks the handle of the Sickle of Leo. Algieba in the Sickle is a splendid binary whose contrasting orange and yellow component stars lie 4.7 arcseconds apart and may be separated telescopically as they orbit each other every 510 years or so. The larger of the pair has at least one companion which may be a planet much larger than Jupiter or, perhaps, a brown dwarf star. Between full moon on the 21st and last quarter on the 28th, the Moon passes very close to the conspicuous planet Jupiter on the 27th. The giant planet rises in the south-east in the small hours and is unmistakable at magnitude -2.0 to -2.2 low in the south before dawn where it is creeping eastwards against the stars of southern Ophiuchus. The red supergiant star Antares in Scorpius lies some 13° to the right of Jupiter while Saturn, fainter at magnitude 0.6, is twice this distance to Jupiter’s left and lower in the twilight. Look for Saturn to the Moon’s left on the 1st and just above the Moon on the 29th. Venus is brilliant (magnitude -4.1) but becoming hard to spot very low down in our morning twilight. More than 10° to the left of Saturn as the month begins and rushing further away, it rises in the south-east 81 minutes before sunrise tomorrow and only 39 minutes before on the 31st. This is a slightly revised version, with added diary, of Alan’s article published in The Scotsman on February 28th 2019, with thanks to the newspaper for permission to republish here. The Sun climbs almost 10° northwards during April to bring us longer days and, let us hope, some decent spring-like weather at last. Our nights begin with Venus brilliant in the west and end with three other planets rather low across the south. Only Mercury is missing – after rounding the Sun’s near side on the 1st it remains hidden in Scotland’s morning twilight despite standing further from the Sun in the sky (27°) on the 29th than at any other time this year. Edinburgh’s sunrise/sunset times change from 06:44/19:51 BST on the 1st to 05:32/20:50 on the 30th. The Moon is at last quarter on the 8th, new on the 16th, first quarter on the 22nd and full on the 30th. Mars and Saturn rise together in the south-east at about 03:45 BST on the 1st and are closest on the following day, with Mars, just the brighter of the two, only 1.3° south of Saturn. Catch the impressive conjunction less than 10° high in the east-south-east as the morning twilight begins to brighten. Both planets lie just above the so-called Teapot of Sagittarius but they are at very different distances – Mars at 166 million km on the 1st while Saturn is nine times further away at 1,492 million km. Brightening slightly from magnitude 0.5 to 0.4 during April, Saturn moves little against the stars and is said to be stationary on the 18th when its motion reverses from easterly to westerly. Almost any telescope shows Saturn’s rings which are tipped at 26° to our view and currently span some 38 arcseconds around its 17 arcseconds disk. Mars tracks 15° eastwards (to the left) and almost doubles in brightness from magnitude 0.3 to -0.3 as its distance falls to 127 million km. Its reddish disk swells from 8 to 11 arcseconds, large enough for telescopes to show some detail although its low altitude does not help. Saturn is 4° below-left of Moon and 3° above-right of Mars on the 7th while the last quarter Moon lies 5° to the left of Mars on the next morning. Orion stands above-right of Sirius in the south-west as darkness falls at present but has all but set in the west by our star map times. 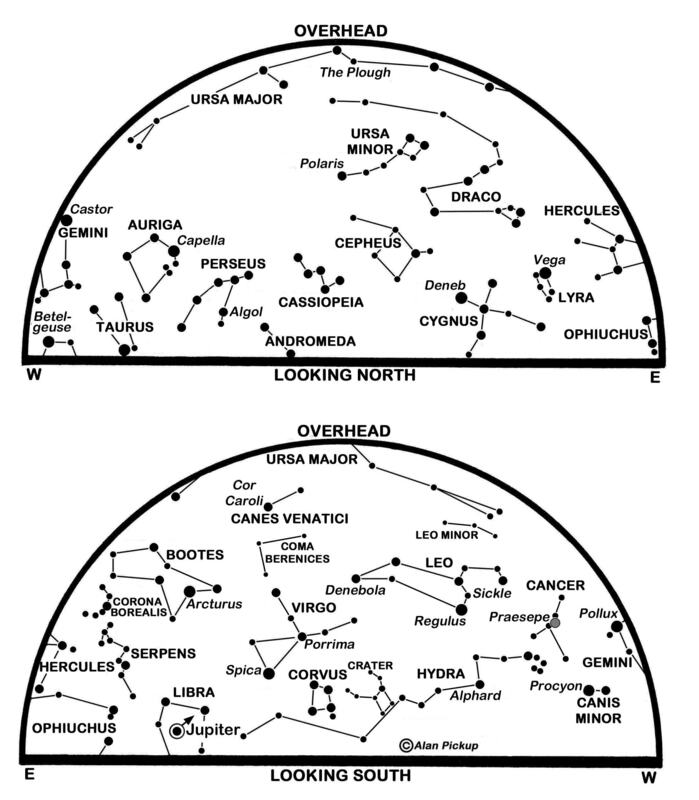 Those maps show the Plough directly overhead where it is stretched out of shape by the map projection used. We can extend a curving line along the Plough’s handle to reach the red giant star Arcturus in Bootes and carry it further to the blue giant Spica in Virgo, lower in the south-south-east and to the right of the Moon tomorrow night. After Sirius, Arcturus is the second brightest star in Scotland’s night sky. 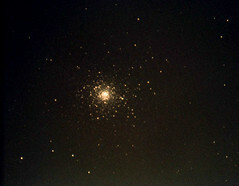 Shining at magnitude 0.0 on the astronomers’ brightness scale, though, it is only one ninth as bright as the planet Jupiter, 40° below it in the constellation Libra. In fact, Jupiter improves from magnitude -2.4 to -2.5 this month as its distance falls from 692 million to 660 million km and is hard to miss after it rises in the east-south-east less than one hour before our map times. Look for it below-left of the Moon on the 2nd, right of the Moon on the 3rd, and even closer to the Moon a full lunation later on the 30th. Jupiter moves 3° westwards to end the month 4° east of the double star Zubenelgenubi (use binoculars). 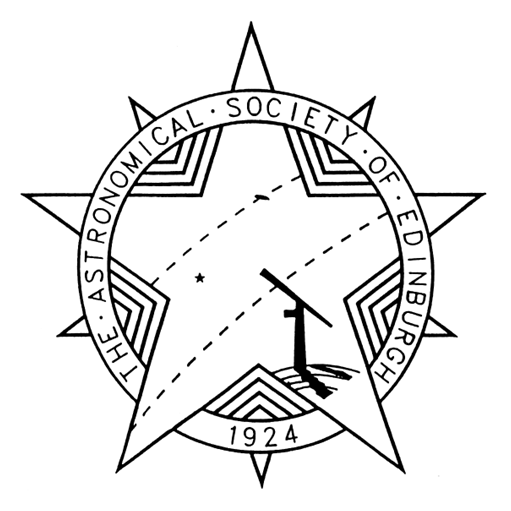 Telescopes show the planet to be about 44 arcseconds wide, but for the sharpest view we should wait until it is highest (17°) in in the south for Edinburgh some four hours after the map times. Venus’ altitude on the west at sunset improves from 16° to 21° this month as the evening star brightens from magnitude -3.9 to -4.2. Still towards the far side of its orbit, it appears as an almost-full disk, 11 arcseconds wide, with little or no shading across its dazzling cloud-tops. Against the stars, it tracks east-north-eastwards through Aries and into Taurus where it stands 6° below the Pleiades on the 20th and 4° left of the star cluster on the 26th. As it climbs into our evening sky, the earthlit Moon lies 6° below-left of Venus on the 17th and 12° left of the planet on the 18th. The reason that we have such impressive springtime views of the young Moon is that the Sun’s path against the stars, the ecliptic, is tipped steeply in the west at nightfall as it climbs through Taurus into Gemini. The orbits of the Moon and the planets are only slightly inclined to the ecliptic so that any that happen to be towards this part of the solar system are also well clear of our horizon. Contrast this with our sky just before dawn at present, when the ecliptic lies relatively flat from the east to the south – hence the non-visibility of Mercury and the low altitudes of Mars, Saturn and Jupiter. The evening tilt of the ecliptic means that, under minimal light pollution and after the Moon is out of the way, it may be possible to see the zodiacal light. This appears as a cone of light that slants up from the horizon through Venus and towards the Pleiades. Caused by sunlight reflecting from tiny particles, probably comet-dust, between the planets, it fades into a very dim zodiacal band that circles the sky. Directly opposite the Sun this intensifies into an oval glow, the gegenschein (German for “counterglow”), which is currently in Virgo and in the south at our map times – we need a really dark sky to see it though. This is a slightly revised version, with added diary, of Alan’s article published in The Scotsman on March 31st 2018, with thanks to the newspaper for permission to republish here.